This is the gold-panning activity area. It’s very popular with kids, mostly because there’s water and sand in that trough. Lots of opportunity to get wet and be messy. And find shiny things. This is the old-fashioned clothes-washing activity area. We also had areas for learning to churn butter, grind coffee, shuck corn, hang wallpaper (one of the many things Job did to earn a living once the population grew was hang wallpaper), and crochet. 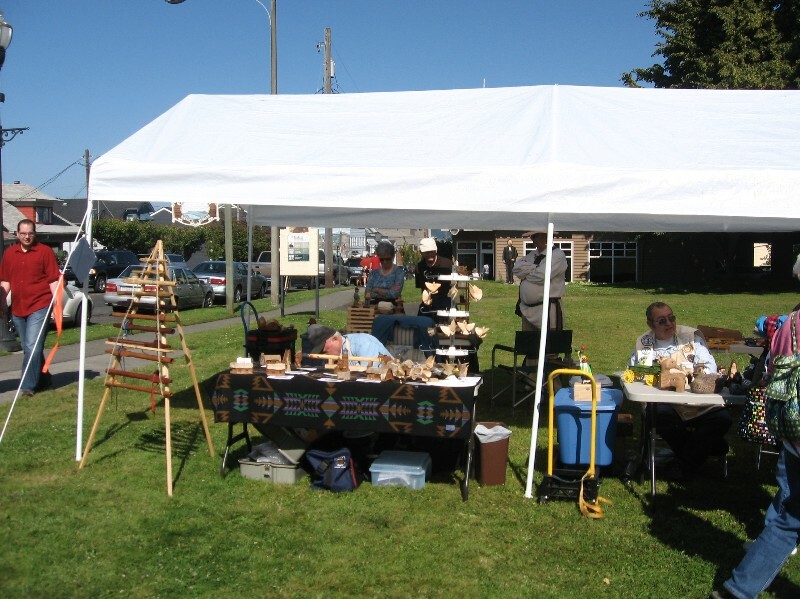 Several areas were set up for demonstrations, as well. Besides my quilting, a weaver shared the porch with me, and under the tents we had a blacksmith and these extremely talented woodcarvers. And our brand-new canoe display. 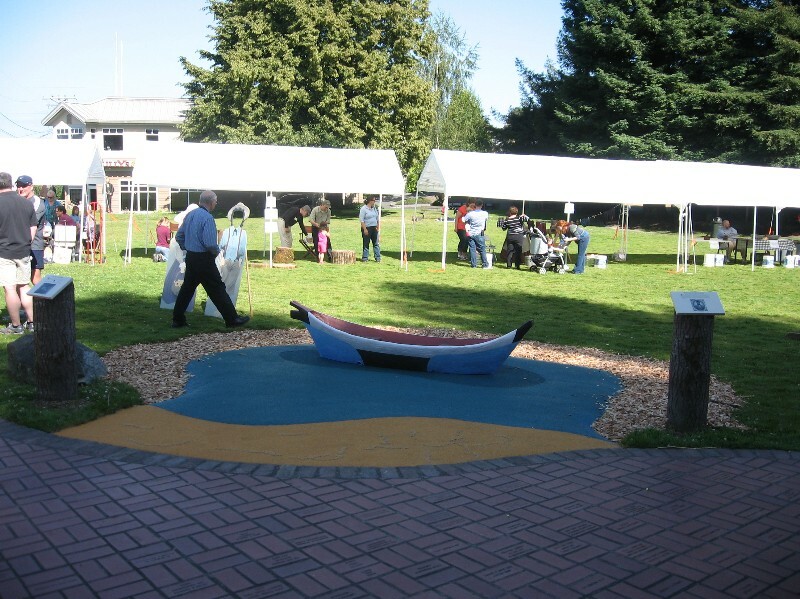 This is a permanent exhibit, and it both tells about how Job found his land claim (by paddling along Commencement Bay in a canoe) and provides a nifty place for kids to play. Oh, and here I am, quilting in public. The dress and apron/pinafore belong to the museum. The project I’m working on is a whole-cloth pattern (whole-cloth is the term for a quilt that’s just one big piece of cloth, not pieced or appliqued or whatever). It will eventually become a pillow. The thimble, if you’re curious, is leather. And, no, I don’t use a hoop or a frame. In 22 years of quilting, I’ve never been comfortable with one. The weather was beautiful, if almost chilly. Pioneer Day was a lot of fun. I hope it was for everyone else, too. Meg was a great part of our Festival. 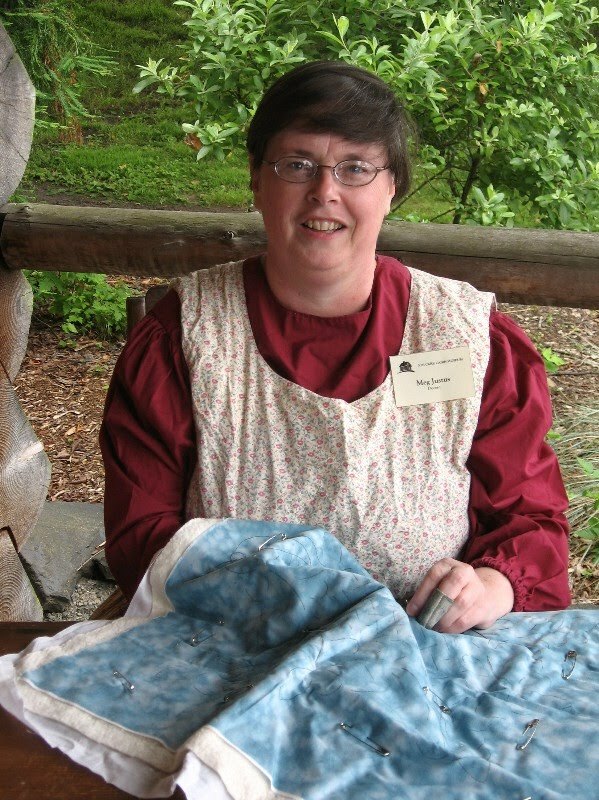 We're really lucky to have a volunteer who knows how to quilt the way the pioneers did (unlike me – a machine quilter, I must confess). Thanks Meg!